Winner Will Receive $20 in FREE item coupons! No matter what season, grilled food is always delicious! Stubb's legendary products will make your Bar-B-Q taste better than ever! 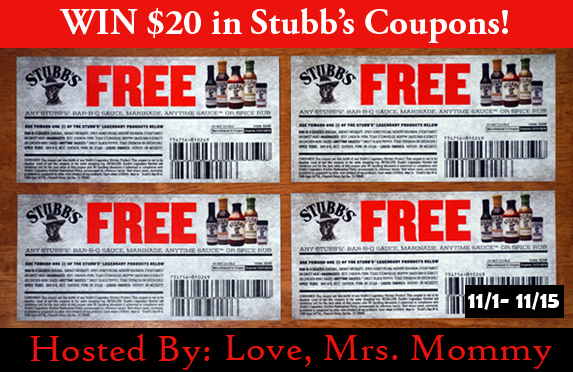 Winner will receive 4 FREE item coupons for any Stubb's Bar-B-Q Sauce, Marinade, Anytime Sauce, Spice Rub, or Liquid Smokes! Coupons are valid till 12/31/2016. I would love to try this sauce with my family. Disclosure: Love, Mrs. Mommy will be fulfilling the prize and is not responsible for lost or damaged packages. All other participating bloggers are not held responsible for prize fulfillment. This giveaway is in no way endorsed or sponsored by Facebook or any other social media site. The winner will be randomly drawn by Giveaway Tools and will be notified by email. The winner has 48 hours to reply before a new winner will be drawn. If you would like to participate in an event like this please contact LoveMrsMommy (at) gmail (dot) com.